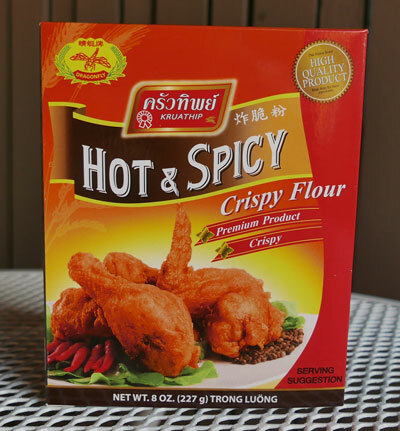 This is a new product from Kruathip similar to their Thai Fried Chicken Batter which has been so popular for years. There are instructions on the package and we offer further guidance with recipe below. Ingredients: wheat flour, rice flour, corn starch, baking powder, pepper powder, garlic powder, paprika, salt. We have been using your products and recipes for a couple of years. All is excellent and authentic. To date I have never tasted better fried chicken than with your batter mix. The khao Padt is also perfect. I lived in Pattaya for about 2 years back in the 1970's and your food brings me back there. Many thanks. Leave it to the Thais to create the best fried chicken in the world. This batter perfectly coats your chicken (or vegetables, as we made fried mushrooms and onions that turned out excellent). Simply mix it with water and sugar (see mix below). You really can't go wrong, and it's just excellent batter. We fried drumsticks and breast slices, then used world-famous Thai sweet chile sauce as a dip. We also prepared this with some added spices to create a "Tom Yum" flavor, which is very delicious, see variant method below.